Scarborough but also claimed the outright lap record. The KMR Kawasaki rider was in superb form in both the wet and dry and was able to take the Darran Lindsay and Phil Mellor trophies as well as a new lap record, the first man ever to lap the 2.41-mile woodland circuit in less than 1m 45s. The success meant he ended the year with a staggering total of 52 road racing victories to his name and an overall tally of 58, six more wins having been attained on the short circuits. Farquhar signalled his intentions from the off and he comfortably took a win in his Superbike heat on Saturday, also lapping within a whisker of Guy Martin’s outright lap record. Next up was the opening 125cc/450cc race and Farquhar had a race long battle with Ian Lougher, the Welshman eventually coming out on top on his 125cc Honda by just 0.25s. He didn’t have to wait long for his first race win though and he dominated the first Superbike race to win by over 4 seconds and it was here where he claimed the outright lap record with a stunning lap of 1m44.932s. Win number 2 came shortly afterwards with a 7-second victory on his ER6 650cc Kawasaki win in the first leg of the Minitwins. Sunday dawned wet and windy, which meant his outright lap record would remain intact, but there was still plenty of racing to be done, his first race of the day being the second leg of the Minitwins. Speeds were considerably down on the previous day and Farquhar was sitting comfortably in second behind Dean Harrison when the red flag came out so he had to settle for second on this occasion although he was able to claim the overall victory on aggregate time, picking up the Phil Mellor Trophy for the first time in his illustrious career. There was no rest for Farquhar and he was back on the grid for the second leg of the Superbikes and he was more dominant in the wet than he had been in the dry, his eventual winning margin being 10.6s, the victory on this occasion giving him the Darran Lindsay Trophy and his 22nd at Scarborough this year! to Lougher in the second leg of the 125cc/450cc race. Farquhar said: “I’m over the moon to have claimed the outright lap record this weekend and I must admit I was quite pleased when I saw the rain on Sunday as I knew no-one would be able to take it back off me! I was near record pace in my heat, which quite surprised me, but I just rode as hard and as steady as I could in the race so to get the record and become the first man to dip below the 1m45s barrier is really pleasing and a great way to end the season. 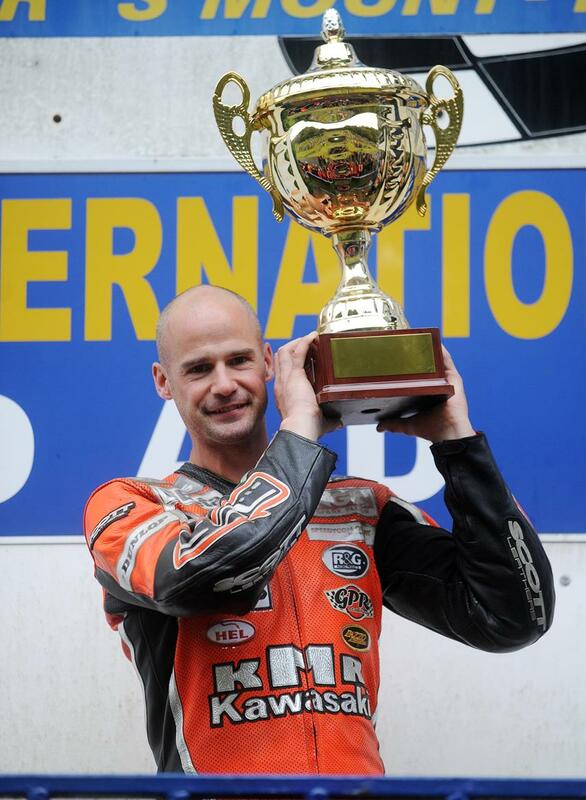 “Winning both the Darran Lindsay and Phil Mellor trophies was equally pleasing as they were both great riders who gave a lot to the sport and whilst it would have been nice to have taken the Gold Cup too, I just didn’t get a good enough start. It’s always difficult here to make back time if you don’t get the start and even more so when it’s wet but I can’t complain, the two Ian’s rode really well. It’s been another fantastic year for myself and the team and I just want to thank all my sponsors and supporters who have been 100% behind me all year long.